Asian elephants stand about 6 to 10 feet tall. They weigh around 5,000 to 12,000 pounds. One of the most interest aspects about elephants is their immense intelligence. Their brains have complex folds and weigh up to 10 pounds, more than other animals. The hippocampus regions of their brains are more developed than any other animal. They are known to exhibit behaviors such as compassion, humor, grief, self-awareness, role-playing, and great learning capabilities. Some elephants in captivity have been taught to paint drawings with their dexterous trunk as well as verbalizing words at the ends of their trunks. The large hippocampus contributes to their emotional intelligence and spatial awareness. Elephants are said to be more able to keep track of objects in 3-D space. Elephants have been seen showing altruism towards other species, such as rescuing dogs. While elephant graveyards may be a myth, death is a quite significant for elephants. Only humans, Neanderthals, and elephants are known to honor and mourn for the dead. When an elephant becomes ill, its herd members will often bring it food and support it to stand. When an elephant starts dying, its herd will try to revitalize it with water and food unless it becomes very quiet, which by then the herd will become silent. Elephants will typically bury their dead mourn for a few day. An elephant that was particularly close has been seen showing signs of depression. Even when a herd passes by a lone elephant that has passed away will bury it and show it similar respects. Elephants have even been known to bury dead humans they come across. 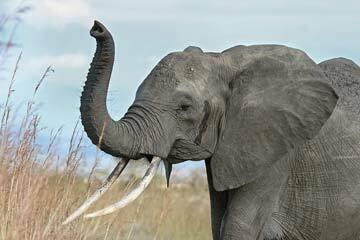 The elephant trunk, a specialized nose, is probably an elephant’s most distinguishing feature. Other than for respiratory and smelling purposes, the trunk is also used for grasping things, drinking, and trumpeting loudly. It is also highly dexterous, similar to an octopus tentacle. In captivity elephants have been taught to use their trunks for painting, picking simple locks, and many other tasks requiring high dexterity and intelligence, which not many animals have both of. Elephants have great hearing; they can hear trumpeting calls up to 5 miles away. Elephant ears are unique in that they are not used only for hearing. The large, floppy natures of their ears function as cooling systems. When elephants flap their eyes, blood flows to the many tiny veins in the ears where it is cooled and circulated back into other parts of the elephants’ bodies. Elephants can sense seismic signals from ground vibrations thanks to the sensory cells in their feet. They are able to transmit deep-pitched sounds from ground vibrations from the sensors in their feet, up their legs, through their shoulder bones, and into their middle ears. Elephants are able to process the timings of the vibrations in each of their front feet to determine the directions of the sounds. Elephants will typically have five toes on their feet, but that number can vary from three to five depending on the species. They can vary between front and back feet. For instance, they can have five on the front and four on the back, or four on the front and three on the back. Again, it depends on what species. Some elephants have evolved sixth toes which start as cartilage that harden into bones as they age.